Mondo has unveiled their second San Diego Comic-Con 2017 exclusive, and it’s a beautiful variant of Phantom City Creative’s new Jaws movie poster screen print dropping later today. 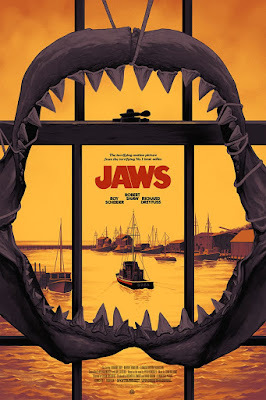 This poster was produced in conjunction with Mondo’s release of the Jaws soundtrack on vinyl – the first time John Williams’ score to the iconic 1975 Steven Spielberg film has ever been officially released as a record. 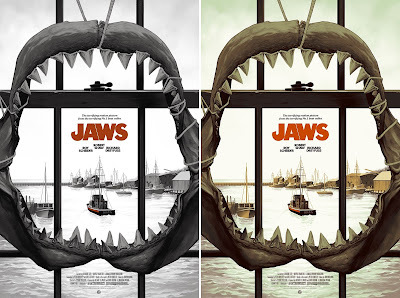 Jaws by Phantom City Creative is a 24”x36” hand numbered screen print. Each of the three colorways is limited to 225 pieces and retails for $45. The monotone (with red details) colorway above is the San Diego Comic-Con 2017 variant of the three colorways being released this month. Collectors can purchase this fantastic print on Friday of SDCC at the Mondo booth.